Guy DiSalvo received his doctorate degree in physical therapy from New York Medical College and has had experience in all phases of the rehabilitation process. Most recently, he worked as an acute rehabilitation staff therapist for nine years at Westchester Medical Center, a Level 1 trauma hospital. He was awarded the distinction of “WMG Care Champion” for exceptional care provided on the physical medicine and rehabilitation unit. Previously, he was a staff therapist in the sub-acute setting at Soundshore Medical Center and as an outpatient physical therapist part-time. 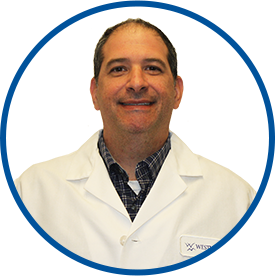 Dr. DiSalvo joined Westmed Medical Group in September 2017.